The Middle East has been conquered by Arab armies under the banners of a new religion, Islam. The first civilizations in world history, those of Mesopotamia and Ancient Egypt, are emerging. The civilizations of Egypt and Mesopotamia are now flourishing in the Middle East. 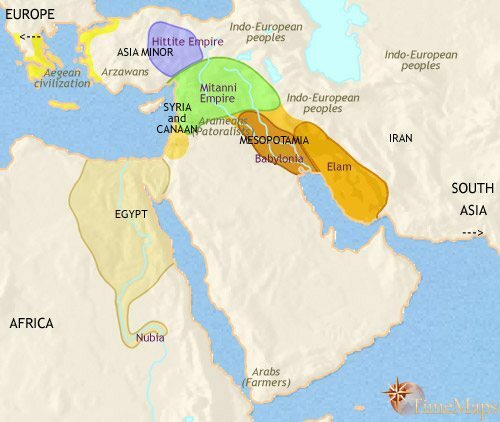 The powerful Bronze Age empires of Egypt, the Mitanni, the Hittites and Babylonia dominate the Middle East. Invasions have devastated the old centres of civilization, but important new developments, such as the use of iron, the appearance of the alphabet and the rise of Israel, with its monotheistic religion, have taken place. A succession of great empires - the Assyrian, the Babylonian, and now the Persian - have dominated the Middle East for the past few centuries. The conquests of Alexander the Great have reshaped the map of the Middle East, and Greek-speaking kingdoms, founded by Alexander's generals, now cover the region. 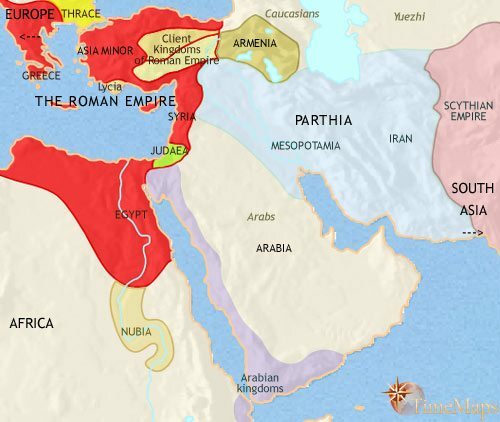 The Middle East is now divided between the Roman and Parthian empires. One small part of the region, Judaea, has given birth to the new religion of Christianity, but has also seen the dispersal of the Jewish people from their homeland. 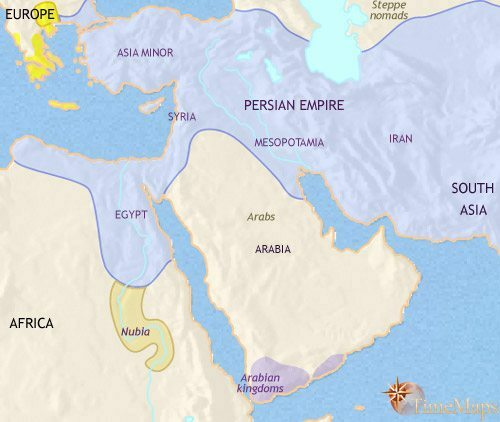 The Middle East is divided between the Eastern Roman empire and the Persian empire. The Islamic Caliphate is beginning to fragment. Islam has by now become the majority religion in the Middle East. The Middle East has been ruled by a succession of conquerors from central Asia. 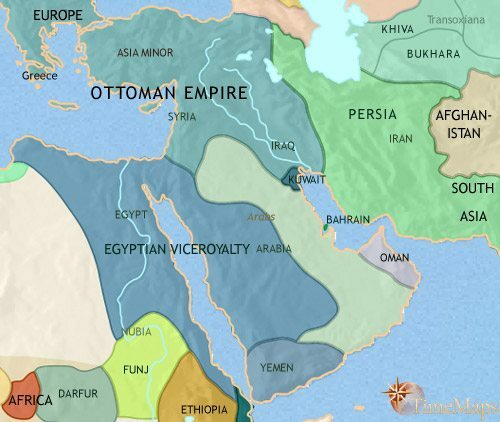 The Ottoman empire now dominates most of the Middle east. 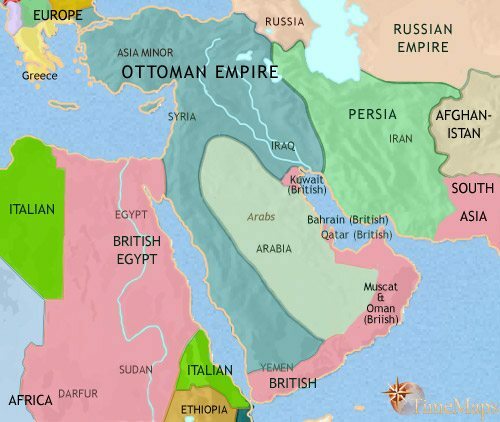 The Middle East experiences political weakness in both the Ottoman empire and Iran. Some Middle Eastern governments are taking steps to modernize their countries. 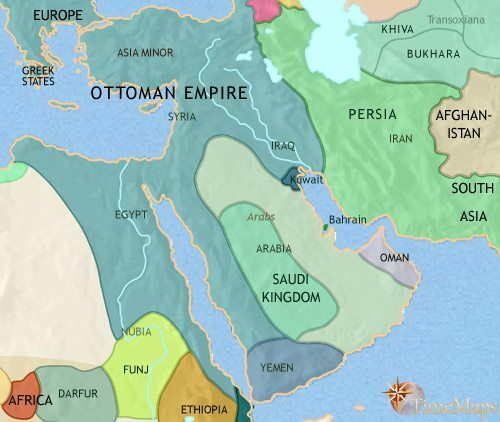 The Ottoman empire has tightened its grip on much of the Middle East. The British and French are increasingly active in the Middle East. The Cold War has had a major impact on the Middle East. Arab-Israeli hostility has dominated Middle Eastern politics. 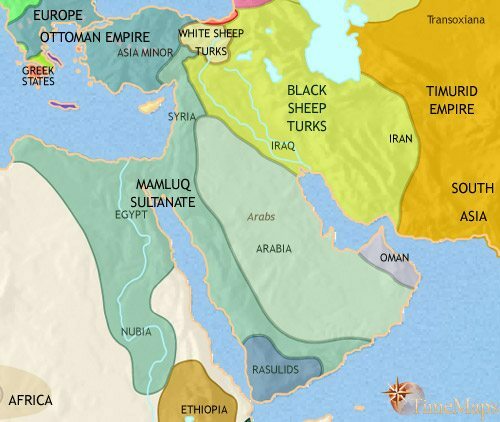 The past two and a half centuries have seen the map of the Middle East change radically. In the 7th century, a prophet, Muhammed, originally a merchant from an Arabian town called Mecca, started preaching a new religion, Islam. By his death he had converted most of the Arab tribes to the new faith. Thus united under the banner of Islam, and freed from their interminable quarrels, the Arabs swept outwards in a surge of conquests: Iraq and Iran, Syria and Palestine, Egypt and North Africa, Spain – all fell to them. By this date, Arab armies have penetrated as far as central Asia, western India and, briefly, into France. The Persian empire vanished under the onslaught, and the Byzantine empire lost its most valuable provinces. 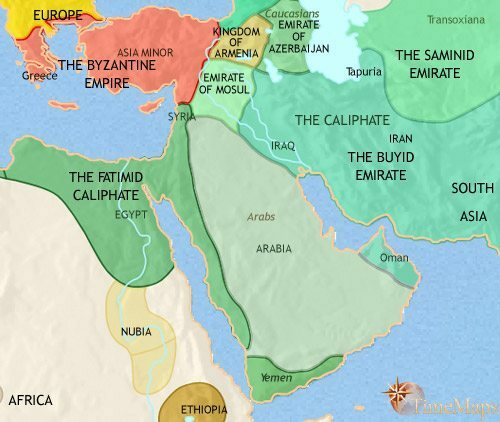 In their place, the Arabs established a vast empire, called the “Caliphate” (“caliph” means “successor”, in this case to the Prophet Muhammed). Up until now the Caliphate has been ruled from Damascus, in Syria. This has been the capital of the Umayyad dynasty of caliphs. The overbearing rule of these caliphs has spawned a number Islamic break-way movements, seeking to install a purer form of rule. One of these is Shi’ism, which will remain an important force within Islam to the present day. The days of the Umayyads are numbered. Already a great rebellion has broken out which will bring a new dynasty to power, the Abbasids. With the change of dynasty, the Caliphate’s capital will very soon move to a new city, Baghdad, in Iraq. Farming has been established for thousands of years in the Middle East, and in the river valleys of ancient Mesopotamia the first true civilization in world history is appearing, that of the Sumerians. The Sumerians live in large communities of many thousands of people – the earliest cities. Along with many other advances they are developing the techniques of writing, on which most future human progress will depend. 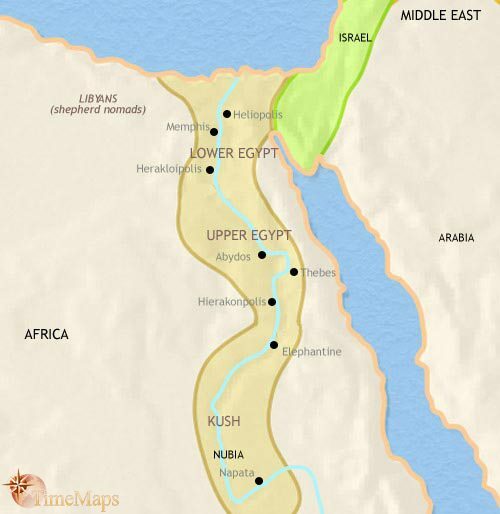 A second civilization is also beginning to emerge in the Middle East, that of Ancient Egypt, in the Nile Valley. In the previous thousand years, the influence of Mesopotamian civilization has spread far and wide. This has been carried by the trade networks radiating outwards from the Sumerian cities. Towns and cities are now scattered over a large part of the Middle East, with outlying regions such as Asia Minor and Iran being drawn into the orbit of urban civilization. The spread of trade routes is linked to a demand for tin and copper. The Sumerians alloy these two metals together to make bronze, which they use in weapons and armour. The second great civilization of the ancient world is now well established. Situated in the Nile valley, Egypt has already produced some of the most famous structures in all history, the great Pyramids of Giza. The past thousand years has seen the rise of fall of the first true empire in world history. This was the achievement of king Sargon of Akkad, in Mesopotamia, in the late 3rd millennium BC. Since then the Middle East has seen many upheavals, particularly in Mesopotamia and surrounding regions. Indo-European speaking tribes have moved in from the northern fringes of the old civilizations and brought with them a new military technology, the chariot. Equipped with this battle-winning technology, they have subjugated local populations to create new states: the Hittite, Mitanni and Babylonian empires. These, together with the New Kingdom of Egypt, form the leading powers of the region. These states are home to highly sophisticated – and already ancient – civilizations, with a complex commercial life, bureaucracies, and well-organised armies, all built around chariot formations. The struggles between them dominate the history of the Middle Eastern world in this period. Over the past 500 years, great changes have wracked the Middle East. 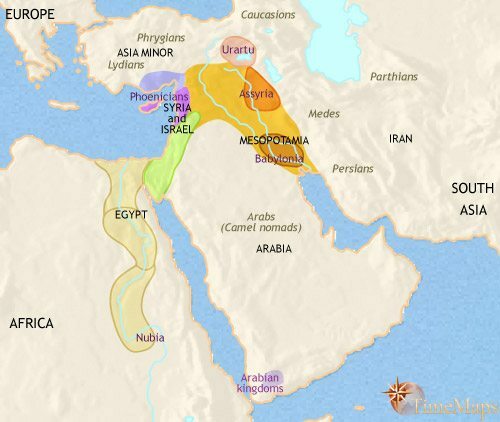 The old powers of the region – Egypt, the Hittites, Assyria and Babylon – have all been devastated by invaders from outside their borders: the “Sea Peoples” from Europe, the Aramaeans from the Syrian desert and the Kuldu (Chaldeans) and other groups from the southern desert. The eclipse of these states has allowed new peoples, particularly the Phoenicians and Israelites, to come to the fore. Their achievements will have an enduring impact on world history. Several major advances in civilization have taken place in region in recent centuries. Firstly, iron has come into widespread use, probably starting somewhere in Asia Minor. Secondly, the alphabet has been developed, again probably in Asia Minor but soon to be spread by Phoenician merchants around the Mediterranean and Middle East. A third occurrence of world significance is the appearance of the monotheism, carried into history by the Israelite tribes. Finally, the camel has been domesticated recently. This tough animal is helping new trade routes across the Arabian desert to come into use. The Olmec civilization of present-day Mexico is the first civilization to appear in the New World. 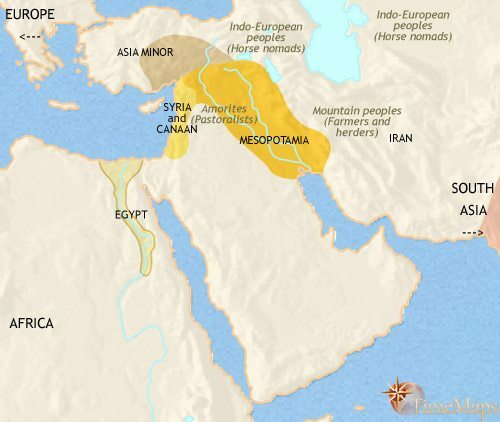 The history of the Middle East over the past 500 years or so has been one of imperial powers following one another in succession: first the Assyrians, then the Babylonians and Medes, and now the Persian empire, the largest state in the history of the Ancient World. The conquest of this huge empire was the achievement of the Persian king Cyrus the Great, the first great ruler of the Achaemenid dynasty (hence another common name for the state he founded is the Achaemenid empire). His successor, Darius the Great now sits on the Persian throne, and is reorganising the empire along more centralised lines. The Persian empire now covers the entire region and beyond. The Lydians, Phrygians and Ionian Greeks of Asia Minor, the Phoenicians and Jews (newly restored to their homeland) of Syria and the Levant, the Egyptians, the Babylonians of Mesopotamia, and the different Iranian peoples, are now all under one regime. This succession of great empires – and the policy that the Assyrians and Babylonians pursued of re-settling conquered peoples in scattered groups throughout their territories – has resulted in the upheaval of populations on a vast scale. As a result, old languages have vanished and Aramaean has become the lingua-franca of the region. With its simple-to-learn alphabet, this has greatly stimulated international trade and inter-regional communications. Middle Eastern civilization, by now three millennia old in its Mesopotamian heartland, has reached new heights. This is the age of the Buddha and of Confucius, two thinkers who will have a huge impact on world history. The past few centuries have seen the huge Persian empire conquered in a series of brilliant campaigns by the young Alexander the Great, king of Macedonia, between 333 and 323 BC. These campaigns involved armies largely recruited from amongst the city-states of Greece. Alexander’s empire failed to survive his early death, and his generals, together with some local princes, divided his conquests amongst themselves. 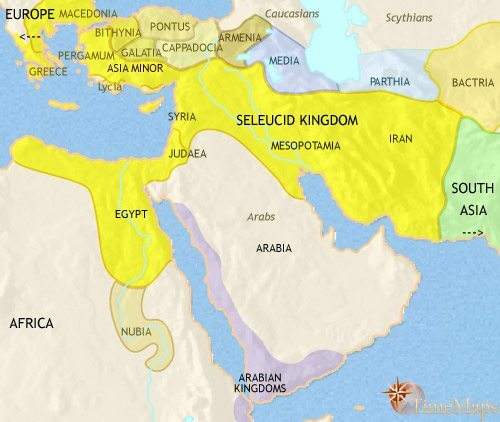 Their descendants now rule powerful kingdoms – the Ptolemies in Egypt, the Seleucids in Syria, Mesopotamia and Iran, and various dynasts in Asia Minor. They have founded numerous Greek-style cities, which can now be found scattered across the Middle Eastern world as far as India, and from which the ruling classes of these kingdoms are drawn. These cities have become the centre for the spread of Greek culture and language (which is replacing Aramaic as the lingua franca of the region). Greek cultural traditions mix with more ancient native elements to form a fascinating hybrid civilization which modern scholars label “Hellenistic”. It is at this time that some of the most spectacular “Greek” artistic and intellectual achievements occur, in countries far away from the Greek homeland. China is now unified under the rule of the Han dynasty of emperors. They will give their huge country centuries of peace and stability. 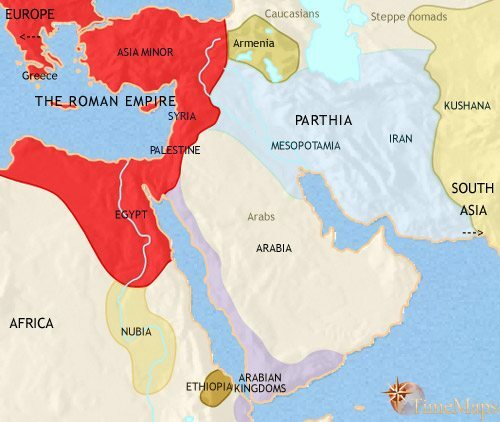 Over the past two centuries the Middle East has been divided between two major powers, Rome to the west, which now controls Asia Minor, Syria and Judaea, and Egypt; and Parthia to the east, which rules Mesopotamia and Iran. This political division will characterize the history of the region for several centuries. The social and cultural division is not so sharp, however. Greek civilization has left its mark on Mesopotamia and other parts of the Middle Eastern world, as a powerful ingredient in a mix containing more ancient cultures. Greek-style (or “Hellenistic”) cities thrive under both the Romans and the Parthians, and in both empires art and architecture continue to be deeply effected by Greek influences. The Greek language remains the lingua franca throughout the region. At around this time, paper is first invented in China. It will make communication much easier than before. 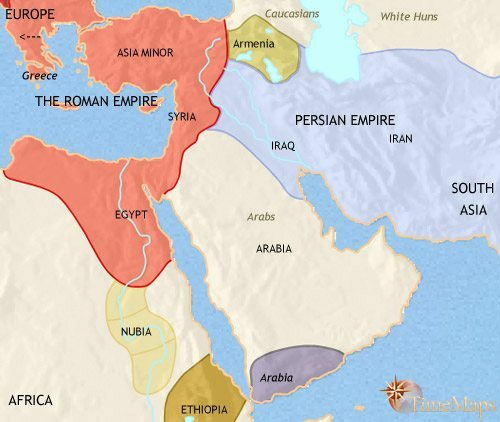 For the past two hundred years the Middle East continues to be divided between the hostile empires of Rome and Parthia, with Asia Minor, Syria and Judaea, and Egypt under the firm rule of the Roman empire, and Mesopotamia and Iran under the Parthians. The kingdom of Armenia acts as a buffer between the two, regularly fought over. The Roman empire normally has the better of the fighting, and has launched two major invasions which have penetrated deep into the heartland of the Parthian empire. At this date Greek culture still predominates, at least in the cities across the region. In the Parthian part, however, there is starting to develop an Iranian revival in art and architecture, and probably also in literature and religion, with a revived Zoroastrianism. This is sponsored by the powerful Iranian nobility, which is increasingly hostile to the Roman power to the west. One small part of the Middle East, Judaea, has seen the birth of one of the major religions of world history, Christianity. Later, however, two great Jewish rebellions against the Romans (66-73 and 132-135) there were crushed, and the Jewish people have been dispersed from their ancient homeland. The extraordinary city of Teotihuacan, in modern-day Mexico, is one of the largest in the world at this time. The Middle East has remained divided between two superpowers. The Roman Empire (now ruled from Constantinople and known to modern scholars as the Eastern Roman Empire) rules the western parts of the region, Asia Minor, Syria and Egypt. In the eastern parts of the region – Iran and Mesopotama – the Parthian empire has been replaced by a new empire under the Persian Sasanian dynasty. The Sasanian kings have proved more aggressive and formidable opponents of the Romans than their Parthian predecessors had. They have presided over an Iranian revival which has centred round the establishment of Zoroastrianism as the state religion. It has been during this period that a distinctively “Persian” civilization, which will later influence much Islamic art, architecture and literature, has evolved. Zorosatrianism has not had it all its own way. In the 3rd century a new Iranian cult, called Manichaeism, briefly won many converts, at all levels of society. However, heavy persecution has since driven it underground. Also, Christianity has spread throughout the Middle East, under both the Romans and Persians; in the towns and cities of both empires it is probably the most popular faith. 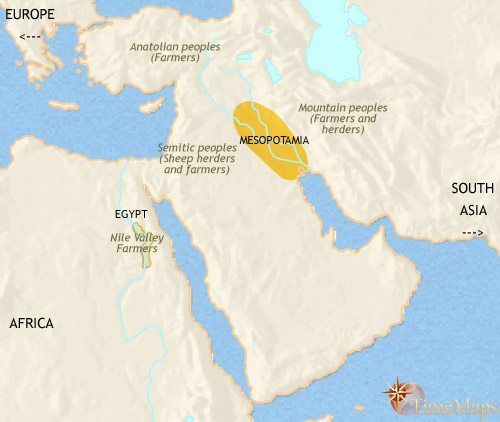 Mesopotamia, with its intensive irrigation agriculture, has long been the breadbasket of the empires of the region, and the Sasanian government invests heavily in its irrigation systems. This, and along with it the entire productive economy of the region, reaches a level which it will not match until the 20th century. The expansion of Mesopotamian productivity increases the wealth of the whole empire. Very soon after 750 Baghdad replaced Damascus as the capital of the Caliphate shifting the centre of gravity of the Muslim world eastward. Shortly after this, different provinces began to fall away from Baghdad’s political control: Spain, North Africa, Egypt, Syria, western India and much of Iran. By this date, the Caliphs have ceased to exercise much political power, even in Iraq. Nevertheless, the Caliphate continues to exist in the minds of Muslims: it is simply that the caliphs have increasingly taken on a more symbolic role as the focus of their religious loyalties. The Muslim world is home to a flourishing, and highly sophisticated, cultural life. Technological and scientific developments have come in from China (for example paper) and India (the decimal system), which Arab scholars add to Greek thought (medicine and philosophy, amongst much else) plus major contributions of their own (including in optics, algebra and philosophy). These different strands mingle and synthesise to form a massive new body of knowledge, almost certainly the most advanced in the world at that time. This will in due course be passed westward to Europe, where it will form the basis for further advance. 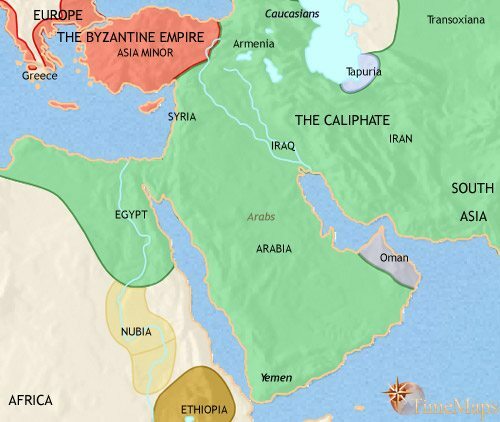 The fragmentation of political power within the Islamic world allows the Byzantine Empire to continue to hold on to Asia Minor. The preceding two centuries have seen the rise and decline of Seljuq power in the Middle East. The Seljuqs were a group of Muslim Turks from central Asia who, swooping down from their homeland, overran Iran, Iraq, Syria and much of Asia Minor, where they took much territory from the Byzantine empire. They were careful not to usurp the spiritual position of the caliphs, but ruled in their name with the title of “sultan”, or governor. Seljuq power soon broke up, however, giving way to regional states ruled by sultans of Turkish origin. 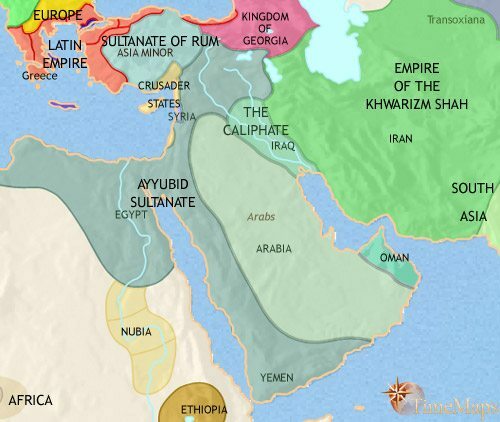 The sultanate of Rum, in Asia Minor, was the most notable of these (“Rum” means “Rome”, because this sultanate lay in former Byzantine, or Roman, territory). Turkish sultans also came to power in Egypt, which had never been conquered by the Seljuqs. These were the Ayyubids, and they have succeeded in conquering up into Syria and far into the Arabian peninsula. The Seljuq conquests, and the stricter conditions they placed on Christian pilgrims to Jerusalem, led to a succession of campaigns from Europe, which attempted to set up a number of Christian states in Syria. These “Crusades” met vigorous resistance, and have all but failed. The Europeans now control only a narrow strip of coast. They will soon lose even this. In recent years, another Muslim Turkish group, the Khwarizm Shah, have taken control of Iran, and the Middle East will see new waves of invaders from central Asia during the next two centuries. The previous centuries have seen further invasions from central Asia. 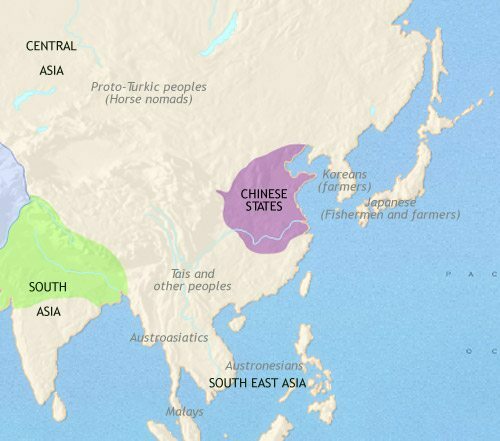 From the 1230s, much of the Middle East came under the rule of the Mongols. They conquered Iran and Iraq, and in 1258 captured Baghdad, killing the last of the Caliphs. They were only stopped by the Mamluq Turks, a group of slave-soldiers who had seized control of Egypt, Syria and western Arabia. They ousted the last Crusader toe-holds on the Syrian coast. The Mongols introduced firearms to the region; the Mamluq armies adopted them and used them to greater effect than the Mongols had done. The vast Mongol empire was divided amongst the descendants of Genghis Khan, and the Middle East fell to a branch which became known as the Il-khans. These converted to Islam. However, the usual decline set in, and a number of regional states emerged. In the 1340s the region was struck by the Black Death. In the late 14th century another conqueror from central Asia, Timur, became master of most of the Middle East, with the major exception of Egypt and Syria, still under the Mamluqs. Since Timur’s death his empire has shrank back to Iran, and Iraq has fallen to another group from central Asia, the Black Sheep Turks. Meanwhile, Asia Minor has now come under the Ottoman empire. In this year, 1453, the Ottomans capture the great Byzantine capital of Constantinople. 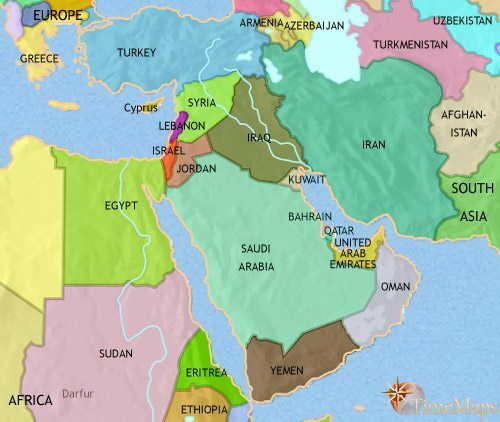 Over the past two centuries, most of the Middle East has come under the rule of two major powers. 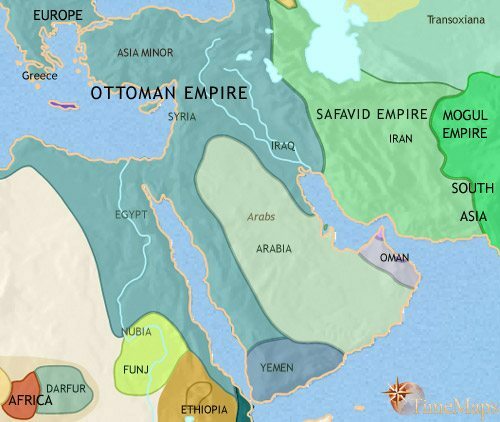 The Ottoman empire sent its armies east from Asia Minor to conquer Syria in 1516, Egypt in 1517, western Arabia (the Hejaz and Yemen) in the following years, and Iraq in 1534. The Ottomans have brought much needed peace and stability to these countries, and a measure of economic progress. To the east has arisen the other major Middle Eastern power, Safavid Iran. Under the Safavids, Iran has experienced a period of great cultural achievement, particularly in architecture. Over the past century, the military garrisons in Syria, Egypt and Iraq, which theoretically answer to the Ottoman sultans in Constantinople, have come to dominate their respective provinces and now govern them as virtually independent states. The Ottoman empire’s hold on the region is more apparent than real outside Asia Minor. Luckily for the Ottomans, Iran has experienced even greater weakness. The Safavid dynasty has fallen from power, and successor regimes have become increasingly unstable. Through all this, the leadership of the Shi’ite branch of Islam has been strengthening its hold on the country. In Arabia, today’s Gulf emirates are being established, and the first Saudi kingdom has appeared. By this date, Western economic interests are being felt in the region. These will only get stronger. In the last years of the 18th century and the early years of 19th, the decline in the Ottoman empire power became all too apparent. Egypt and Syria came under a break-away regime, and Iraq was governed as a virtually independent state. Now, however, there are signs of a revival. Iraq first, and now, Syria, are being brought back under the firm control of the Ottomans. Egypt, however, has been lost to the Ottomans. It is treated by Western powers as an independent state. Iran continues to experience weakness and instability. The small Arab emirates on the Gulf coast are beginning to feel the power of the British navy. In Arabia, the first Saudi kingdom was crushed, and a second one has now appeared. The past decades have seen the lands of the Ottoman empire experience renewed centralized rule, with the provincial elites in Syria and Iraq being brought firmly back under the authority of the sultan’s government. Egypt is by now an independent kingdom. In Iran, weak government and social stagnation continue; while remaining politically independent, the country is coming increasingly under the economic control of Britain. In fact, European (especially British and French) influence is growing throughout the region. The opening of the Suez canal has turned the Middle East into a vital strategic interest for Western powers. The canal is a main thoroughfare for Western trade, as well as an important link in the military chains tying the European powers to their overseas empires in East Africa, India, SE Asia and the Pacific. In recent decades, the Suez canal’s immense importance in linking European nations with their empires in East Africa, India, SE Asia and the Pacific has placed the Middle East right at the heart of their concerns. The British, being the leading global power, are at the forefront in establishing their interests in the region. Egypt has now drifted under their political control, as have several small emirates on the Arabian coast. British commercial interests predominate in Iraq and Iran – which is also a target for Russian influence. French commercial influence is strong in Syria. 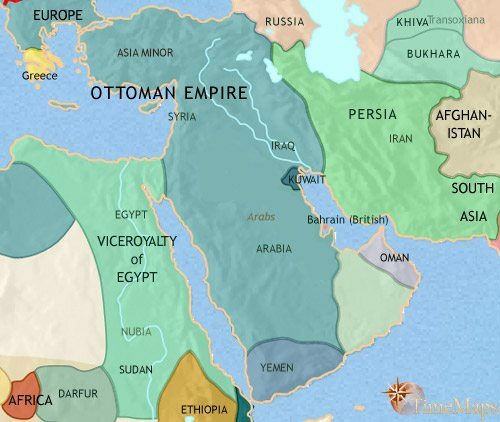 In the face of these pressures, the Ottoman empire has continued to tighten its control over Anatolia, Syria and Iraq, and is also intent on modernizing its dominions’ economies. The Ottoman government seeks to balance British and French influence by developing closer ties with Germany. In the Arabian peninsula, a third Saudi kingdom has appeared, and this time it will endure. Two further developments which will have a dramatic impact on the coming decades in the region are the arrival of Jews in increasing numbers in Palestine, from the 1880s onwards, and the discovery of oil in Arabia, in 1901. The decades since 1914 have been ones of great change for the Middle East. The Ottoman empire sided with Germany and Austria in World War 1 (1914-8), and afterwards was broken up amongst the nations of Turkey, Syria, Lebanon, Jordan, Iraq and Saudi Arabia. All except Turkey and Saudi Arabia were at first under British or French control. Iraq became independent in 1933. 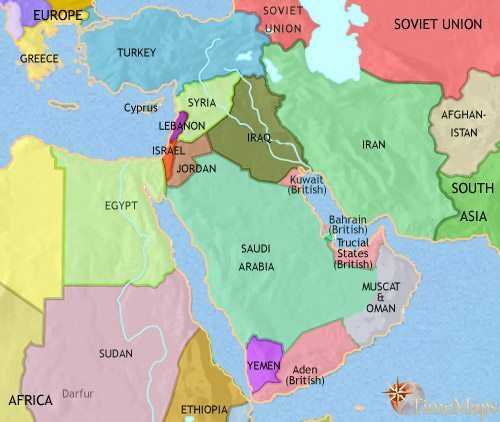 After World War 2, Syria, Lebanon, Egypt and Jordan became independent. In 1948 the British left Palestine, under fire from both Arabs and Jews. The Jews declared the independent state of Israel. Bitter fighting between Jews and Arabs followed, but Israel continued in being. The politics of most Middle Eastern states has been autocratic, and frequently unstable. They have also been deeply affected by the Cold War, with some (Syria, Egypt) veering towards the pro-Soviet camp and others (the monarchies of the Arabian peninsula, Turkey, Iraq and Iran) towards the West. Israel, on the whole pro-West, has retained a western-style parliamentary system. The oil industry is transforming many Middle Eastern countries, especially in the Gulf region, giving them hitherto undreamed of wealth. For the Middle East, the last few decades have been troubled ones, dominated by two issues – oil, and Arab-Israeli hostility. Such are their geopolitical importance to the rest of the world that the region has attracted constant global attention, and frequent intervention. The first of these, oil, has brought economic progress and dazzling modernity to several countries, especially in the Arabian peninsula. The second has directly involved the surrounding countries of Syria, Lebanon, Jordan and Egypt, and, indirectly, all the countries of the region. It has brought two full-scale Arab-Israeli wars (the Six Days War in 1967 and the Yom Kippur War in 1973), plus several bloody disturbances on – and within – Israel’s borders. After the 1973 war the oil producing countries grouped together in an organization called OPEC and imposed an embargo on the sale of oil to those countries in the west which had supported Israel. Virtually every major episode in the region’s recent history has been touched to a greater or lesser extent by these two issues. The rise and fall of Saddam Hussein in Iraq (which involved two wars against the US and one or more of her allies, the Gulf War in 1991 and the Iraq War in 2003) and the Islamic Revolution in Iran, have had their impact multiplied by them. The Arab-Israeli question has made it much harder for Muslim leaders to adopt pro-Western policies, and has given anti-Western terrorist organizations widespread support. Oil wealth has helped finance terrorism, and has impeded the spread of democracy in the region: apart from Israel, Turkey is the only country to have developed a proper parliamentary-style system of government.